I don't really need to say much more, other than read the flier to the left / above / below /wherever blogger decides to put it in the particular format in which you read the blog! However, I would like to encourage men to come to this event (I've already got my ticket), and to invite others. 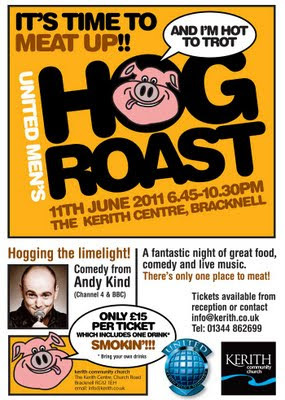 We've got a "proper" comedian (for more info on Andy Kind have a look here), a live band and genuine "man" food (no fruit salad, broccoli or couscous anywhere). You can get tickets from the table in reception for the next two Sundays, or by emailing into reception during the week.